The speech of Aeschylus, Sophocles and Euripides echoed there from ancient times till today. Mystagogy of theater art at the unique creation by Polykleitos. The Ancient Theatre of Epidaurus is located in the city of Epidaurus, on the southeast end of the sanctuary dedicated to the ancient Greek God of medicine, Asclepius. It is built on the west side of Cynortion Mountain, near modern Lygourio. It is considered to be the most perfect ancient Greek theatre with regard to acoustics and aesthetics. According to Pausanias, the ancient theatre was constructed by the architect Polykleitos the Younger. Pausanias praises the theatre for its symmetry and beauty. 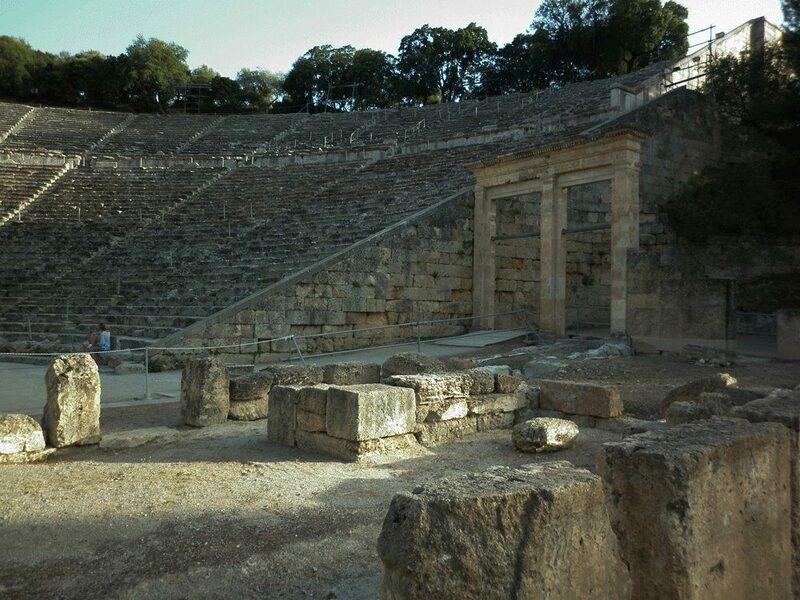 At a maximum capacity of 13,000 to 14,000 spectators, the theatre hosted music, singing and dramatic games that were included in the worship of Asclepius. It was also used as a means to heal patients, since there was a belief that the observation of dramatic shows had positive effects on mental and physical health. Today, the monument attracts a large number of Greek and foreign visitors and is used for the performance of ancient drama plays. The first modern performance conducted at the theatre was Sophocles’s tragedy Electra. 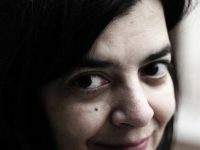 It was played in 1938, directed by Dimitris Rontiris, starring Katina Paxinou and Eleni Papadaki. Performances stopped due to World War II. Theatrical performances, in the framework of the organized festival, began again in 1954. In 1955 they were established as an annual event for the presentation of ancient drama. 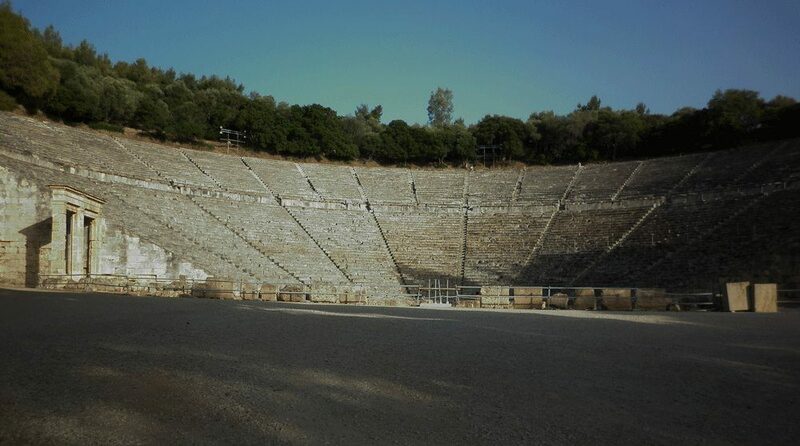 The Epidaurus Festival continues today and is carried out during the summer months. The theatre has been sporadically used to host major musical events. In the framework of the Epidaurus Festival, well-known Greek and foreign actors have appeared, including the Greek soprano Maria Callas, who performed Norma in 1960 and Médée in 1961. The first systematic excavation of the theatre began in 1881 by the Archaeological Society, under the direction of archaeologist Panayis Kavvadias and preserved in very good condition thanks to the restorations of P. Kavvadias (1907), of A. Orlandos (1954-1963) and the Preservation Committee for Epidaurus Monuments (1988 to 2016). With the work done, the theatre has been recovered – except the stage building – almost entirely in its original form. The monument retains the characteristic tripartite structure of a Hellenistic theatre that has an auditorium, orchestra and staging building. During Roman times, the theatre (unlike many Greek theatres) did not suffer any modifications. The theatre’s staging building was constructed in two phases: the first is placed at the end of the 4th century BCE and the second in the middle of the 2nd century BCE.